Dated 4 July 1955, most of a letter from Stuart Anderson, Chief Clerk of the Cabinet Office, to my Mum, then Miss Jacqueline Clarke, offering her a job. 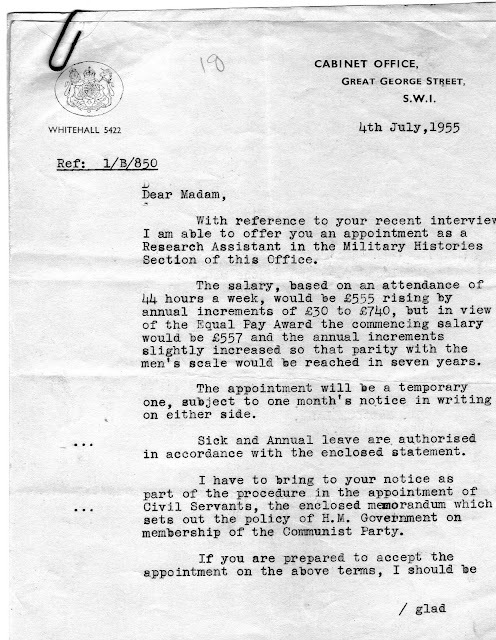 What is interesting is of course a) mention of the Equal Pay Award (January 1955), and b) the question of membership of the Communist Party. Unfortunately the 'enclosed memorandum' has gone astray. Mum had actually been a member of the Labour League of Youth, a Trotskyist front organisation, before joining the Labour Party. I don't think this is what made her decline the job offer. What did I do not know, but they were 'circumstances beyond her control'. Possibly a proposal of marriage (which, in strictly mercenary terms, would allow her to write rather than have to earn). She was 31 years old at this date.